Next earlier Happy Tail: Dogs in Toyland Posted September 07, 2014. My son, Chip, sat on a horse for the first time when he was two weeks old. 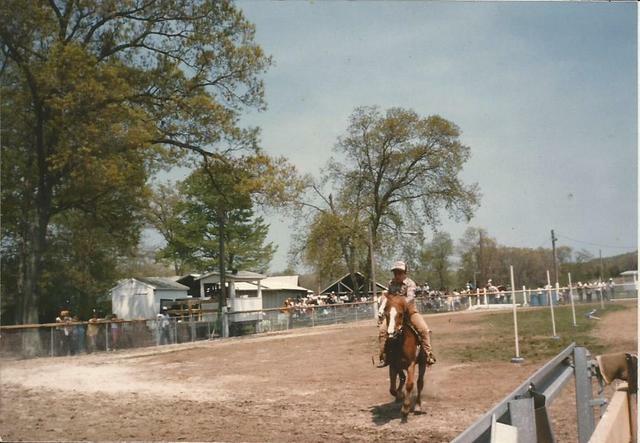 He grew up around the horses and rode in his first horse show while he was still in diapers. He progressed from Lead Line (where you ride but are led by an adult), to Walk Trot (where you ride alone but only Walk & Trot), to Gymkhana (which is a timed speed event around barrels or poles.) 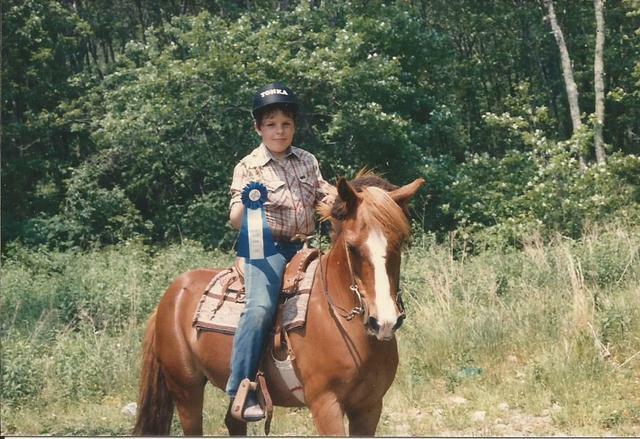 The first year he rode Gymkhana he had a feisty little pony we called Noel. She wasn�t fast but it gave him confidence and he learned the patterns. When he turned 8 he was ready for a faster mount. A friend of mine, Jerry Grudzien, said he had just the pony for Chip. Jerry and I had competed against each other when we were teenagers and he had two sons just a year or two older than Chip. So when he offered to sell me a pony I trusted him and bought it over the phone, sight unseen, for $250. Jerry delivered the pony one night after dark. A plain brown pony got off the trailer. She wasn�t special looking and I began to doubt if I should have taken Jerry at his word. Her name was Tonka. Chip rode Tonka the next day. Jerry had given us a special bit he said you had to ride her with or you couldn�t control her. Chip practiced the barrels and the poles on her. She didn�t run very fast and I wondered why she needed such a strong bit. After we had her for a little while I took her and Chip to a schooling show so he could practice before show season began. The first class was Pole Bending. Chip had been riding Tonka outside the ring and she was mellow and relaxed. Then he entered the ring. This little pony transformed to a wild woman. She pinned her ears back and raced down the arena. I couldn�t believe how fast she was. She caught Chip off guard and not expecting her to be so responsive he turned her too sharp and they hit a pole. They finished the class with a five second penalty but an amazingly fast time. Tonka taught us our first lesson: Looks can be deceiving. Over time we discovered that this sweet little girl meant business when she entered the show ring. She would fly down the arena and weave through the poles in almost a straight line. Chip had to be careful not to lean too much or he would hit the poles with his shoulder. The first year he showed her, at age 8, he won the Pole Bending division in three states against adults and horses. Tonka could also pull her own against the horses in Barrels and Keyhole. She had a hard time in Arena Race since it was straight up and straight down but she could still place. 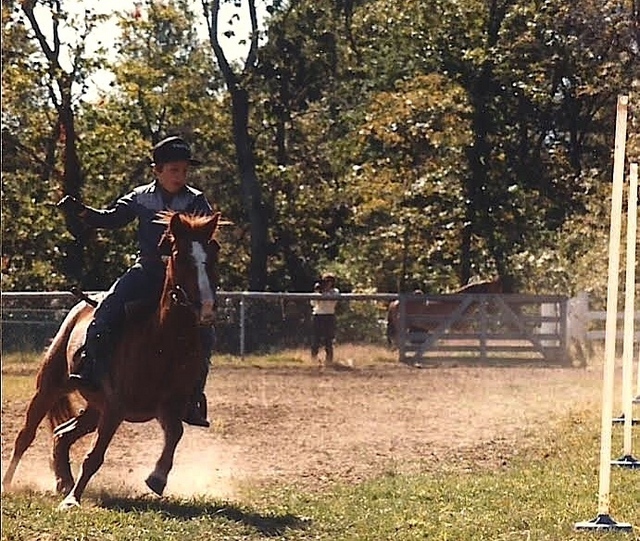 There was another competitor, Cindy, who rode an Appaloosa that always gave Chip and Tonka a run for their money. Their times were always close. Cindy was a good sport and would joke with Chip and encourage him while he was running. The event was timed by an electronic timer which recorded in 1/100�s of a second. Chip and Tonka�s time in Pole Bending was always in the low 28 seconds. One horse show Cindy went first. She and her horse set a new record � less than the 28 seconds, a high 27. As Chip got ready to enter the ring I told him �that�s a fast time to beat, you might just get second this week.� I swear Tonka knew what I said. She went in the ring, pinned her ears and outran Cindy�s time. Chip and Tonka won Pole Bending again. The third year Chip showed Tonka he was 10. He was getting bigger but the pony wasn�t. She still ran like the wind and cut the poles close but Chip would often hit them with his shoulder. He still won first in Pole Bending that year but it became obvious he had outgrown the pony. When the show season ended we talked it over and decided we should sell Tonka. It wasn�t that she hadn�t earned a forever home with us but she was such a talented pony she needed to teach another young rider how to ride in gymkhana. I advertised her and a woman from Ohio contacted me. She had twin girls, 5 years old that competed in the rodeo circuit. One girl had a super pony but the other girl needed one. I told her how Chip and Tonka had three successful years and that it was time for her to move on. So she bought Tonka over the phone without ever meeting her. We drove Tonka to New Jersey where someone picked her up to take to her new home in Ohio. I cried as she loaded onto the trailer. But to her it was just another adventure and another rider to train. Her mom got on the phone and told me how she had the same reaction I did when Tonka was unloaded off the trailer. This little nondescript pony could never do the things I said she did. She found out just like I did. Tonka ran like the wind in her first rodeo and taught another up and coming rider all about gymkhana. 2014-09-22 - Connecticut - Photo from Peg Schaeffer. 2014-09-22 - North Stonington, Connecticut - Photo from Peg Schaeffer.